We enjoy various chicken dinners at least twice a week here in our home. With that said, we do get bored with having the same old chicken dish and are always looking for new delicious chicken recipes to try out in our home. When looking for recipes, we look for ones that are easy-to-prepare and use ingredients that we can find in any grocery store. The great folks over at IMUSA sent over this recipe for me to share with all of my Shakin N Bakin Foodie Blog readers. It looks easy to prepare and wow...delicious looking too! Adding this one to my recipe box for sure! 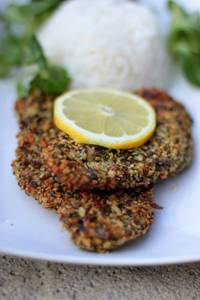 Celebrity Chef and mom herself, Michelle Bernstein, has created an exclusive recipe for IMUSA for her delicious Pumpkin Seed- Crusted Chicken - a tantalizing dish that combines savory and sweet flavors for the ultimate eating experience. Best part about it? It's super easy to make. Packed with lite and healthy ingredients, Mom won't have to spoil her healthy diet and you won't have to do much work to create it. The appetizing flavors of this recipe are perfect to satisfy not only the mature taste buds of mom but the kids will also love the sweetness of the pumpkin seeds. Toast the pumpkin seeds and ancho powder in the IMUSA sauté pan on medium high heat. Remove, crush in the IMUSA Bamboo Mortar & Pestle, and place in a large bowl. Add salt, pepper and fresh thyme. Stuff the goat cheese underneath the chicken skin of the breast then dredge the chicken on both sides in the mixture and remove. Heat the IMUSA sauté pan on medium heat, add olive oil. Place the chicken, skin side down into the pan. When it becomes golden, flip the chicken and place into the oven for 12 to 15 minutes. Serve with a green salad or favorite vegetables. Disclosure: The recipe and photograph are courtesy of IMUSA. Please visit their web site for additional recipes and for information on the kitchen tools & products that they sell. No compensation has been received and I am NOT affiliated with the company in any way. Note: You can print out this recipe by clicking on the SHARE button at the bottom of this post. A new window will pop up, click on the PRINT button and the recipe will load into the window for printing.